 All Major Credit/Debit Cards accepted. 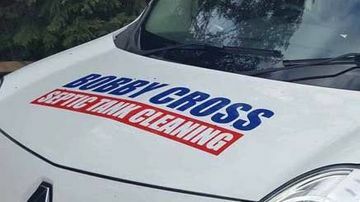 Welcome to Bobby Cross Septic Tank Cleaning. Established for over 30 years. We have a wide range of machinery, ready to tackle any task, no matter how big or small. Our company aims to provide a comprehensive service to all customers. We are renowned for our affordable prices and fast turnaround service. 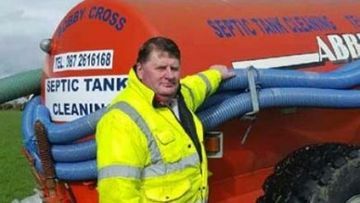 The team at Bobby Cross Septic Tank Cleaning are fully licensed to carry out septic cleaning, desludging, emptying and much more. 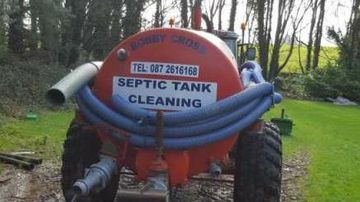 Bobby Cross Septic Tank Cleaning are on hand to carry out a range of services, such as septic tank cleaning, drain cleaning and agricultural services. Why choose Bobby Cross Septic Tank Cleaning? Over 30 years of experience in business. We have the expertise to get the job done. We are known for our affordable prices. We are well known all across Wicklow & South Dublin. Our reputation has been built on reliable service and affordability. We work with both commercial and domestic clients.